The first big media poll since the start of the campaign finds Labor looking strong ahead of Saturday’s Victorian election. At last, a statewide Victorian poll result – and it suggests the betting markets might have been on to something in their move to Labor. The YouGov Galaxy poll for the Herald Sun gives Labor a 53-47 lead on two-party preferred, which compares with a result of almost exactly 52-48 in 2014. The two parties are reportedly both on 40% of the primary vote – as Kevin Bonham observes, this would be more indicative of a result of 54-46, which raises the possibility (though by no means the certainty) the the Greens are down. More to follow. UPDATE: Actually, the Greens are a solid 11%. Daniel Andrews leads Matthew Guy as preferred premier by 47-35. UPDATE: In a spirit of long-awaited buses arriving all at once, The Age has a uComms/ReachTEL poll, conducted yesterday evening from 1239 respondents, which concurs with YouGov Galaxy in recording something of a Labor blowout. Labor leading 39% to 36% on the primary vote, with the Greens on 10.4%, which converts into 54-46 on two-party preferred, presumably on the basis of respondent-allocated preferences. Nothing further on the primary vote yet, but Labor leads 53-47 as best party on population and 56.6-43.3 on cost of living (The Age report seems inconsistent in its approach to rounding), while the Coalition leads 52-48 on crime. There is a problem with the youtube reference you gave. I expected music but it was Mike Oldfield. No, it is not a trick question. It is probably the difference between the way the Vic Parliament and the Federal Parliament work. I am far more used to the latter. 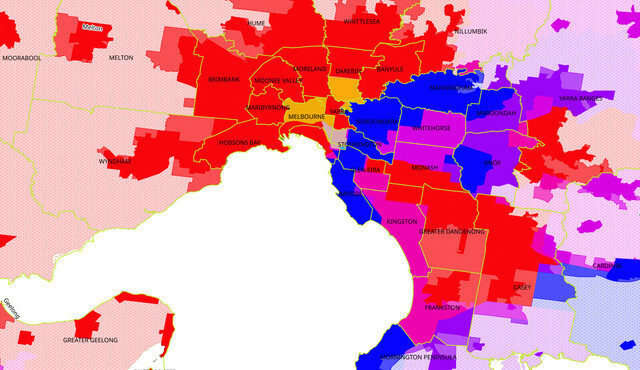 In the Federal Parliament, the relationship between percentage of votes won, and seats won, is highly non-linear. At the Federal level, once one side gets 53% of the vote, it becomes close to a landslide, with the lucky party getting significantly more than 53% of the seats. Hahahahaha! Very funny, philistine. Okay, try this one then. I think in general Victoria seems to have the least swinging seats in federal elections, which is probably why our state elections also have so little seat movement compared to federal elections nationally. Federal elections are generally won & lost in QLD and western Sydney, whereas regardless of what the overall result is, Victoria’s seat count generally remains pretty static because there is just so much safe territory for both sides and almost no marginal turf at all. 2019 may be an exception because the anti-LNP swing will likely be felt harder in Victoria than any other state, potentially turning safe Liberal seats with 5-10% margins into genuine contests. So at state level, where the Libs are a little more competitive than federally, it’s the same situation. Safe red in the north, west & outer southeast, safe blue in the east and inner bayside, and really just a handful of battlegrounds in the sandbelt with a couple of scattered marginals around regional cities. I have friends with all sorts of different views on politics, and I can discuss things with them without any animosity. 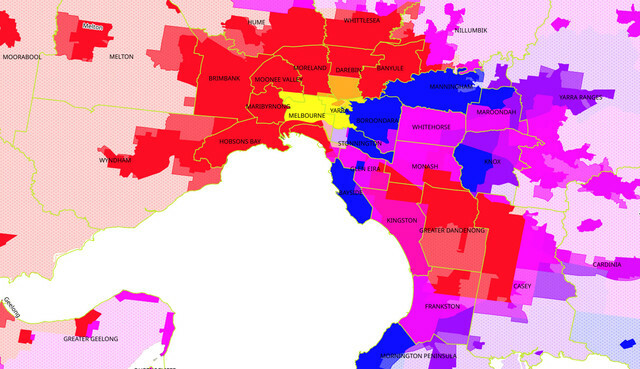 there’s very few seats that actually change hands; Victoria is pretty polarised/sorted more than gerrymandered. Population growth has also lead to some malapportionment. That image above is state representation since 2002. Obviously the yellow/orange/grey areas are actually Green, but since they haven’t been Green for long, they aren’t very green. The image here shows federal representation since 1996 and state since 2002. You can see it hardly changes anything at all. It’s good to know you’re not totally devoid of civilised influence. I’m going to watch some Red Dwarf then go to sleepy-bo-bos. Next time, the music is on you. So proud of this Andrews gov. They came in with a deliberate plan that they werent going to die wondering. They embraced a pragmatic social policy agenda, invested big time in critical infrastructure and left their mark on any number of initiatives. They outthought, outsmarted and bypassed the traditionally hostile mainstream media and embraced social media to get their message across. Timelapse Facebook videos of progress on each railway crossing were ubiquitous. Voters controlling their own inter-group preferences is more democratic than inter-group preferences being distributed by candidates/parties directly through group ticket voting because the voters are actually in full control of where their preference go. Parties/groups being voted for as a party/group through group systems is a feature of a majority of multi-member systems around the world. Allocation of surplus vote for groups to other groups is extremely rare. Major party candidates being elected with low personal primary votes has actually been happening in the Senate since the introduction of preferential voting in 1919. Between 1919 and the introduction of proportional representation in 1949, majoritarian preferential voting distributed all the preferences (at full value) of the first 2 (or more in the case of casual vacancies) winning candidates after they were each elected for the election of the next candidate. This lead to the windscreen wiper system of one party getting all the Senators up for election in a state (Except in Victoria in 1928). That is about parties successfully corralling their vote in a specific order chosen by the party (which has been less successful in Tasmania and the ACT because of their use of Hare-Clark). Micro parties are not one single party, they are over a dozen little parties with views differing across the spectrum and all have at least one major part between them and other political parties on the political spectrum and so the combined vote of micro parties does not indicate a collective will to get any micro party candidate elected. The new Senate electoral system showed itself to allow new parties to be able to get votes and win seats. Hinch`s Justice Party came from nothing to win a seat and had the votes to have won that seat in a half-Senate election. One Nation won 4 seats and would have won 1 at a half-Senate election under the Same system (with the potential capacity to win another seat at the other-half-Senate election). Lambie, disqualification issues aside, got enough votes to win at a half-Senate election, as did NXT. Harradine, back in they day, won without Group Ticket Voting, as did the DLP (and that was with the same quota as now used in the Legislative Council of Victoria). I seem to remember a rule of thumb in two party systems. The ratio of the cubes of the TPP values approximates the ratio of seats. Yep Tom, and when you remove GVTs, we will organise ourselves into electable groups. If we need more diversity in parliament, we will get it to the extent that quota/district size is small enough. But we will get the diversity we vote for instead of unpredictable diversity. And the parties that did get in hardly had great success. The DLP member defected to Australian Conservatives, which should be the exact opposite and greatly offensive to any DLP voter. FFP under Fielding (a would-be Xenophon) was a completely different party than FFP under Day (who would have fit better in the LDP or AC). Election on the basis of random has not been effective at representation. So I don’t think Chris Curtis needs to worry. You are correct about earlier major party candidates’ Senate victories form small primary votes. I was just referring to the STV period. The 2016 Senate results were affected by the smaller DD quota. As far as collective will goes, people are free to endorse their party’s preference arrangement or not. If they endorse it, the result is fair. It is very easy to vote below the line in Victoria. I agree with what you say re the DLP and FFP, but I don’t agree that the election result was random. It was mathematically precise. As there is a new thread, I won’t pursue this issue here, but I will return to it as will many others over the next few months.